Much has been made of the fact that with the arrival of CAPTAIN MARVEL, the Marvel Cinematic Universe finally had its first film in which a woman served as the lead. While this is certainly reason to celebrate, and undoubtedly a step in the right direction, let’s not forget that DC had already broken this barrier with Patty Jenkins’ thrilling WONDER WOMAN. Whereas CAPTAIN MARVEL seems to merely exist in order to provide the backstory necessary for the superhero to swoop in and save the day in AVENGERS: END GAME, WONDER WOMAN stood solidly on its own, and became the marquee production in the DC Universe. 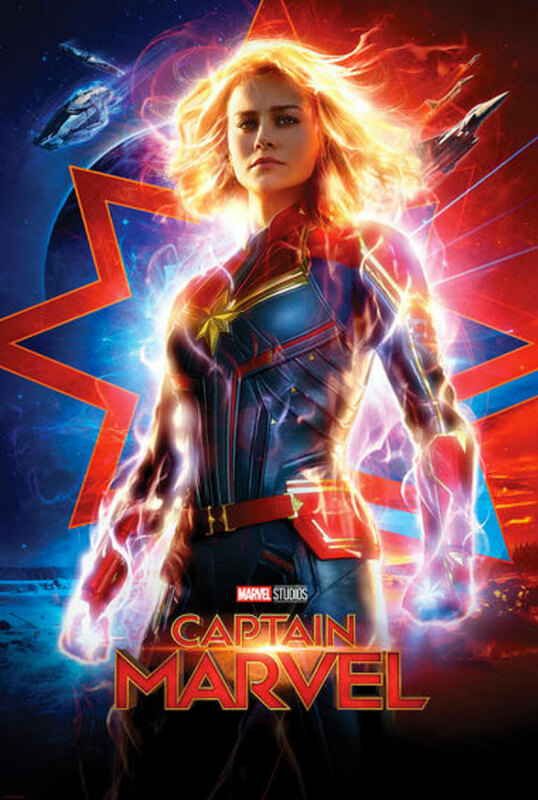 Set long before the Avengers were assembled, and even before Nick Fury (Samuel L. Jackson) garnered his trademark eye patch, CAPTAIN MARVEL tells the story of Vers/Carol Danvers (Brie Larson). A talented fighter pilot with a steely drive, a desire for heroics, and hands that can summon a photon blast, she has dreams in which she converses with a woman who is connected to her in some way, though she can’t remember why. The woman (Annette Benning) encourages Vers to tap into the greatness that she knows she has inside of her, but realizes that she still has a way to go before she can fully harness her own potential. After she is taken captive by an alien race lead by Talos (Ben Mendelsohn,) the beings attempt to tap into her mind in order to discern information from her past. They seem convinced that her brain holds a secret that they can exploit for some nefarious purpose, but before they can decode the mystery, Vers escapes (in daring, high-octane fashion, of course). 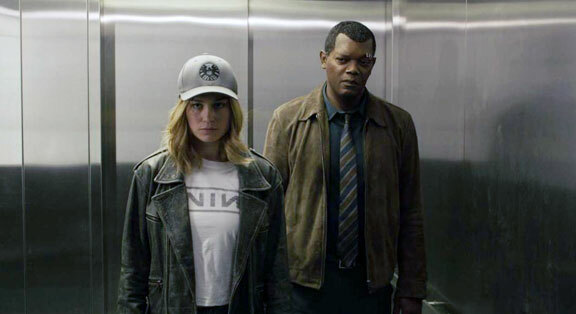 After fleeing, she crashes through the ceiling of a Blockbuster Video sometime in the mid-90’s, and soon crosses paths with Agent Clouson (Clark Gregg) and Nick Fury. Though Fury doubts her story at first, when they are fired upon by a shape-shifting alien, he soon changes his tune. Meanwhile, Vers’ crew, led by Yon-Rogg (Jude Law) are on their way to Earth to assist, but it becomes abundantly clear that Vers and Fury must work together in an effort to thwart whatever vile plan that Talos is on the verge of executing. Larson was a great choice to lead CAPTAIN MARVEL, and she treads the line of serious superhero and wise-cracking warrior with power and grace. She is formidable without being overbearing, and seems to welcome the burden of standing as Marvel’s first leading lady. And, while this is certainly the story of Carol and her journey to unlock her past and save the world, there is little arguing that Anna Boden and Ryan Fleck’s film soars to its greatest heights when Larson and Jackson are sharing the screen together. Their chemistry is light and believable, and their rapport with one another feels completely natural. The effects used to create a younger iteration of Nick Fury are seamless, and though there are plenty of explosions, battles, and beautiful set pieces, in a way, it’s his transformation that stands as the most impressive special effects work in the entire production. Despite many of its elements working in its favor, CAPTAIN MARVEL was a rare miss for the MCU. To chalk it up to superhero fatigue would be to take the easy way out, because the truth of the matter is, this is nowhere near the best that the MCU has had to offer. Coming off the phenomenal BLACK PANTHER and the emotional INFINITY WAR, CAPTAIN MARVEL felt like a significant step backwards. I feel uneasy even saying that, given that it is progressive in many ways, but at the end of the day, a movie needs to be entertaining. Aside from a few action sequences (even these are somewhat lackluster) and brief moments of humor, the story was not nearly as engaging as the majority of the other chapters in the iconic Marvel Universe. Truthfully, CAPTAIN MARVEL really can’t compare to any of the best that the canon has to offer, and other than serving as an introduction to one major character and providing a little backstory for another, it is largely forgettable. From its plot, to its action, to its soundtrack, it played out like a middling STAR WARS film, minus the lightsabers. Given the MCU’s track record of one impeccable release after another, when there is a minor misstep such as this, it leads to you to question where they will go from here. With the next epic AVENGERS film arriving in theaters at the end of April, we’ll certainly get an answer sooner than later.